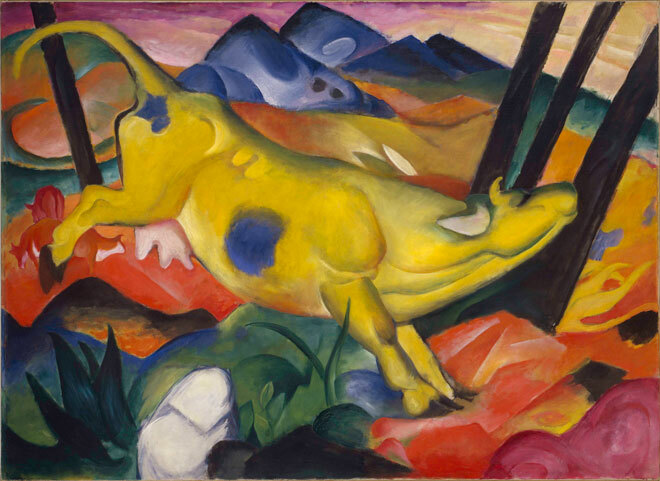 TORONTO — Nearly 100 years after the First World War began, the artistic frenzy that swept Europe in the years leading up to the conflict comes alive at the Art Gallery of Ontario (AGO) in The Great Upheaval: Masterpieces from the Guggenheim Collection, 1910-1918. Featuring over 60 works by 36 artists including Kandinsky, Picasso, Modigliani and Chagall, the exhibition explores several years of unprecedented social, political and technological change through painting and sculpture. Organized by the Solomon R. Guggenheim Foundation, New York, and supported by Lead Sponsor BMO Financial Group, the exhibition makes its only Canadian stop at the AGO from Nov. 30, 2013, to March 2, 2014. "BMO Financial Group has a long-standing commitment to supporting the arts and the communities in which we do business,” said Gilles Ouellette, President and CEO, Private Client Group, BMO Financial Group. "As Lead Sponsor of the exhibition, BMO has an opportunity to connect with customers and local art enthusiasts, helping to promote an understanding and appreciation of foundational, influential works from the early 20th century within our community." Timed-entry tickets for The Great Upheaval go on sale on Nov. 15, 2013. Previous ticket buyers can book tickets on Nov. 13 and 14, 2013. Regular-priced tickets range from $16.50 for youth visitors to $25 for adults. Admission is FREE for AGO members and for children ages five and under. Tickets can be booked online by visiting www.ago.net/guggenheim-great-upheaval. The AGO explores the era of The Great Upheaval with a series of talks and events that immerse visitors in the period from 1910 to 1918, when telephones appeared, news was becoming instantaneous, the tango was all the rage and tanks, parachutes, x-rays and mustard gas had recently been invented. Beginning Jan. 15, 2014, the AGO will be offering free weekly tango lessons in Walker Court from 6:30 to 8:30 p.m. On Jan. 22, 2014, the AGO will be screening early abstract art films in Jackman Hall. Several talks will offer insights from field specialists exploring the art and culture of the time, and tickets can be booked online. For a complete list of programming and to book tickets, please visit ago.net. This exhibition is organized by the Solomon R. Guggenheim Foundation, New York. Founded in 1937, the Solomon R. Guggenheim Foundation is dedicated to promoting the understanding and appreciation of art, primarily of the modern and contemporary periods, through exhibitions, education programs, research initiatives, and publications. The Guggenheim network that began in the 1970s when the Solomon R. Guggenheim Museum, New York, was joined by the Peggy Guggenheim Collection, Venice, expanded to include the Guggenheim Museum Bilbao which opened in 1997, and the Guggenheim Abu Dhabi, currently in development. Looking to the future, the Guggenheim Foundation continues to forge international collaborations that take contemporary art, architecture, and design beyond the walls of the museum. More information about the foundation can be found at guggenheim.org.